Cornerstone was brought in to upgrade the 10,000 sq. ft. of office space for a food distributor to make the space more aesthetically appealing, easier to maintain and free of bacteria that was living in the previously installed carpet. 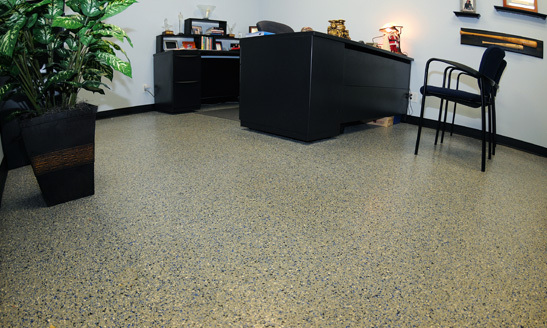 The challenge facing the installation team was to remove, prep, and install a new flooring system without interrupting the client’s daily business practices. Cornerstone was also tasked with meeting the design and color needs of the client. The Cornerstone installation team removed the existing carpet, vinyl, and tile throughout the office space and then prepared the substrate through mechanical preparation utilizing HEPA filtration. All excess dust, curing agents, and contaminants were removed so installation could proceed. The substrate was then leveled to ensure even distribution of the flooring system. After the substrate was leveled, a polymer primer was spread before the mortar mix was applied with a screed box and troweled to a 3/16″ nominal thickness. The system’s grout was added and immediately back rolled before paint flakes were added to the wet mortar. After removal and sanding of excess flakes, yet another layer of grout was spread and a final topcoat was added to help guard against skid and abrasion incidents and add a level of seamless durability to the finished OfficeFloor® flooring system. The finished Cornerstone OfficeFloor® not only remedied the clients need for quick and clean installation that will meet all their aesthetic design needs, but provided a finished product that guards against bacteria and deterioration from heavy traffic and use.The flooring system is easy to clean and maintain and included UV stability and light reflection to save energy and maintenance expenses.